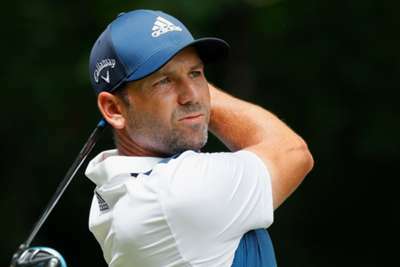 Defending champion Sergio Garcia was one of a select group of players to complete his opening round at the Andalucia Valderrama Masters on a weather-affected first day, and he trailed leader Ashley Chesters by two strokes at the close of play. After all tee times were pushed back by two hours to allow a storm to pass, play was disrupted again later on Thursday due to the threat of lightning. Sixty players did not complete their rounds, but Garcia did not allow the conditions to hinder him. Hosting the European Tour event with the Sergio Garcia Foundation this week, the Ryder Cup star ended his 18 in front as he carded a three-under 68. But the lead would not last as he was pegged back before weather interrupted again, with Chesters finishing his round with a pair of birdies for a five-under 66. Gregory Bourdy, in second place, was a shot further back. And while several other players are set for an early start in order to catch up on the first round, Chesters was eager to continue himself. "It's a shame I can't keep going because the last few holes were the best I played all day," he said. "Considering all the delays and everything, I'm very happy with five under. It was nice to finish like that." Lee Westwood did manage to finish, with an even-par 71, and his day was improved by the presence of his son Sam as his caddy. "It was a long one," Westwood wrote on his Instagram page. "Shame about the finish but we're right in there." Matteo Manassero finished on a disappointing five over, but he almost executed one of the shots of the day, digging an effort out of the bunker and through a tree in a bid to rescue par at the fourth. The ball agonisingly rolled away from the hole.